Variations of VSD What Are Its Effects? Eisenmenger Complex is usually associated with large untreated VSDs. 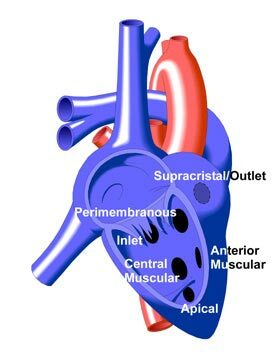 Initially, the higher blood pressure in the left ventricle will cause a left to right shunt, which increases blood flow to the lungs through the pulmonary artery and often results in pulmonary hypertension. This pressure injures the lung arterioles, which gradually increases the resistance to pulmonary blood flow until the direction of shunting through the VSD is reversed and moves from right to left. The result is cyanosis (blueness caused by low oxygen saturation in the arterial blood supply) because oxygen poor blood from the body tissues is now shunted from the right ventricle into the left ventricle through the VSD and pumped right back to the body tissues via the aorta. The damage caused by high pulmonary blood pressure may not be recognized until later in life when the patient becomes cyanotic and experiences fatigue during exercise, particularly if he or she lives at a high altitude. As long as the PVOD is relatively stable, the patient may be able to cope with relatively minor symptoms. However, the situation may deteriorate over time as the symptoms worsen and collateral damage to the heart develops, such as a breakdown in right ventricle and tricuspid valve function. Other symptoms, including fainting (syncope), chest pain, arrhythmias, decreased tolerance for exercise, the coughing up of blood, and even sudden death may occur.